It automatically detect & decrypt passwords from secret password store of each supported browsers. Once recovered, you can remove all or selected Twitter password, thus preventing it from being stolen by hackers, ransomware, password stealers etc. 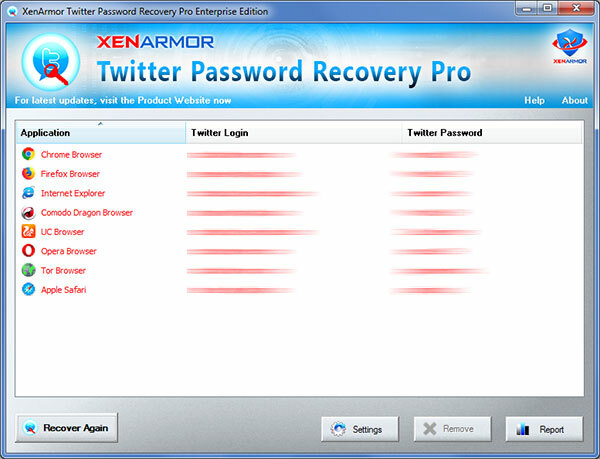 Twitter Password Recovery Pro' 2019 Edition works on all 32-bit & 64-bit platforms from Windows XP to new Windows 10 version. Support for recovery of Instagram passwords from all profiles of Chrome, Firefox, Seamonkey browsers.